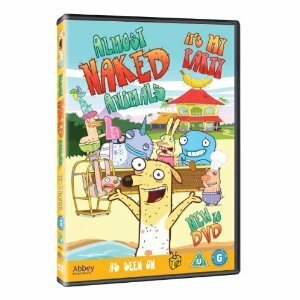 Although I had heard of Almost Naked Animals, the popular CITV children’s show, it is not a programme that we normally watch so I was interested to find out if Miss M would enjoy the new DVD of the show Almost Naked Animals – It’s My Party by Abbey Home Media. The DVD contains six episodes centering around the Banana Cabana, a beachfront resort hotel and home to mayhem, destruction and all round general fun. There is also some bonus material included on the DVD. I let Miss M watch the DVD a few times while I was busy and then sat down with her a few days later to watch it for myself. As soon as the music started she starting singing along to the catchy theme tune which surprised me a little as I’m fairly sure she hadn’t seen the program before but had picked up the little tune in a just a couple of times of watching. I then found her concentrating on the episode and telling mummy to be quiet so she could watch and listen!! Almost Naked Animals definitely agreed with Miss M and she thoroughly enjoyed watching the hilariously comical antics of Howie and his friends, from laughing at their pants being too tight to them all sliding around in cake batter after spilling a huge vat of it across the kitchen floor. This DVD would bring great entertainment value to a wide range of children and would make an excellent stocking filler this Christmas. If you fancy getting your hands on a copy of the Almost Naked Animals – It’s My Party DVD, then Abbey Home Media have kindly offered me 4 copies to giveaway to my readers – so just follow the instructions below. This entry was posted in Giveaways, Reviews and tagged Almost Naked Animals, CITV, DVD, giveaway by Fiona Martin. Bookmark the permalink. I’ve entered – my little boy would love this! already liked on fb too! I’d like to be entered into the draw please!